This Pepper Steak Recipe is a great one-pot Chinese-American meal that you can make on the stove for the family in 30 minutes. 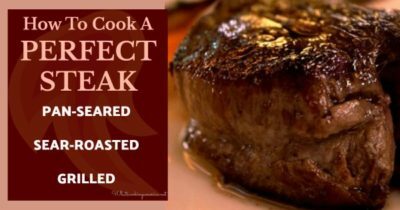 Y ou could also prepare this steak in the slow cooker and have it ready to eat when you get home in the evening. In this recipe I have provided stove-top and slow cooker instructions. The aromas of this pepper steak while cooking brings back fond memories of my Grandma’s house. Whenever we went over for a visit, she was always cooking with green bell peppers. The wonderful smells filled her kitchen. I loved her stuffed green peppers! Green bell peppers are not for everyone, but my grandma loved them and I enjoyed all her meals. Pepper steak, in particular, was one of the dinners I remember enjoying at her home. If you are not a fan of green bell peppers, you can always substitute the sweeter and milder yellow and orange bell peppers. * May substitute 1/2 teaspoon powdered ginger. ** Learn how easy it is to make your own homemade Beef Stock. *** May substitute 15.5 ounce canned diced tomatoes, drained. In a medium-sized bowl, add garlic, ginger, soy sauce, and sugar; stir until combined. Add steak strips into the soy sauce marinade. Using your hands, massage marinade into steak. In a large skillet over medium-high heat add the vegetable oil. When oil is heated, add steak with soy sauce marinade and let meat cook for about 5 minutes. Turn heat down to medium-low and let simmer on stove for approximately 10 to 15 minutes. While beef is simmering, in a small bowl add cornstarch and beef broth; stir together until the cornstarch is dissolved; set aside. Turn heat back up to medium-high and add onions. Saute for a few minutes until onions appear translucent. Next add bell peppers and sautfor a few minutes until peppers have softened and still have nice bright colors. Pour in the prepared beef broth mixture and stir to combine with the beef and vegetables. Let cook until sauce starts to thicken. Stir in tomatoes and cook until tomatoes are warmed. Remove from heat and serve beef and vegetables over plates of cooked rice. Garnish with sliced green onions or sesame seeds and enjoy. In a medium-sized bowl, add garlic, ginger, soy sauce, and sugar; stir until combined. cAdd steak strips into the soy sauce marinade. cUsing your hands, massage marinade into steak. In a large skillet over medium-high heat add the vegetable oil. When oil is heated, add steak with soy sauce marinade and let meat cook for about 5 minutes to brown. Add onions and saute for a few minutes until onions are soft and translucent. Pour steak and onions, with all the juices, into the slow cooker. In a small bowl add cornstarch and beef broth; stir together until the cornstarch is dissolved and then pour over the steak and onion mixture. Cover with lid and let cook on low heat for 8 hours or high heat for 4 to 5 hours. During the last 30 minutes of cooking, add bell peppers and stir together to combine. When ready to serve, stir in the tomatoes until warmed. Serve beef and vegetables over plates of cooked rice. Garnish with sliced green onions or sesame seeds and enjoy.